Who said you can’t enjoy alcoholic beverages without guilt? Not me. Especially when we’re talking about a refreshing, festive beverage like summer sangria. I used to work as a young chef in Spain. There, Sangria was the new wine. The country gets so hot in the summer that the Spanish prefer a glass of Sangria because it’s so much more refreshing than wine. Beware, though. If you’ve been trying to lose weight for a while, you know how to stay away from alcohol and sugar. And Sangria, in the wrong hands, can be just that: alcohol and sugar. Thankfully, I fixed it for you, and the calories are under control in this slimmed down version. No sugar added, it’s also full of fruit and orange juice, so that you get plenty of fiber and vitamins. If you want, you can replace the orange juice by any juice you want, as long as it doesn’t have any sugar added (just look into the list of ingredients and make sure sugar is not one of them). And you can replace the fruits I use with any fruits you like. Finally, you can use white wine or even Champagne if you prefer. It’s also the easiest thing to do. I know how much you like ultrafast recipes, and this is definitely one of them. It is perfect for a summer outdoor party, for instance. In fact, in my house, summer without sangria just isn’t summer. 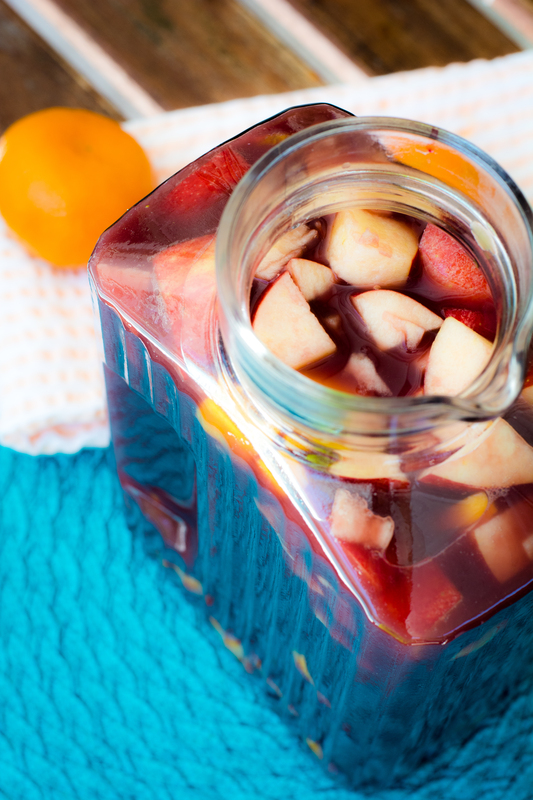 Fun fact: Sangria is common in Spain and Portugal, but only got introduced to the U.S. quite late, in 1964. So it’s time to make the best of it this summer, and insert this drink into your fat-burning diet.